Figure 1.1 The faith of the Upper Guinean dwellers and their forests is closely intertwined. 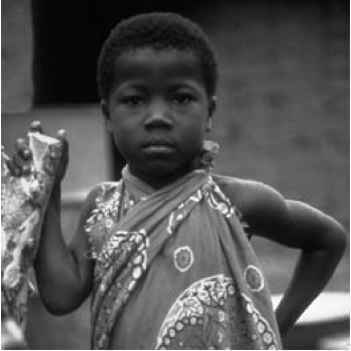 The photo shows a small boy in a Krou village near Para, southwest Côte d'Ivoire. Moroccan Berbers, who referred to the lands south of the Sahara as "Akal n-Iguinawen", or "Land of the Blacks". This was subsequently modified by early Portuguese travellers to "Guinea" (Martin 1991). Lebrun (1947) was the first one to coin the African tropical forests as the "Région guinéenne", later renamed by Monod (1957) as "Région guinea-congolaise". The Guinea Congolian region is a distinct phytogeographic region with a relatively homogeneous flora (White 1979). White defined a phytogeographic region as a regional centre of endemism, when it has more than 50% of its species confined to it, and when it has more than 1000 endemic species. Within the Guinea Congolian region there are tree subcentres of endemism: the Upper Guinea subcentre (corresponding to the Domaine libéro-ivoréen of Aubréville, 1962), the Lower Guinea subcentre, and the Congolian subcentre (Figure 1.2). Upper Guinea is separated from Lower Guinea by the Dahomey gap, a savanna vegetation with few endemic forest species. Gambia river. Another large mangrove area is found south of the Casamence river, along the coastline of Senegal and Guinea Bissau, up to western Guinea. The rainforest belt starts in eastern Sierra Leone, and stretches along the coast to Liberia, Côte d'Ivoire, and Ghana. This rainforest belt is up to 350 km wide, but becomes as narrow as 100 km in Côte d'Ivoire, where a V-shaped savanna intrusion approaches the coast. In Ghana the rainforest finally gives way to savanna. The savanna area is 300 km wide, and covers the coastline of eastern Ghana, Togo and Benin. Here, forests are only found at higher altitudes, on the Togo plateau, and as small islands on the plains. Incidentally, forests penetrate into the savanna, as gallery forests along river courses. The tropical forests of Africa cover c. 2.8 million km2 (Beentje et al. 1994), of which 109,000 km2 belongs to Upper Guinea (1992 data from Sayer et al. 1992). In Upper Guinea, 99,200 km2 is lowland forest, 8700 km2 mangrove forest, 450 km2 swamp forest and 480 km2 montane forest (Sayer et al. 1992, Table 1.1). It is estimated that the African tropical forests contain 12,000 forest plant species, of which 6400 species are endemic (Beentje et al. 1994). The Upper Guinean forests contain 2800 vascular forest plant species, of which 650 species (c. 23%) are endemic, and c. 400 species are considered to be rare (Jongkind, chapter 11). Families with relatively many endemic species are Acanthaceae, Anacardiaceae, Euphorbiaceae, Leguminosae-Caesalpinoideae, Rhizophoraceae, Rubiaceae, Sapindaceae and Zingiberaceae. A few monotypic genera are endemic to the Upper Guinean forests, for example Dinklageodoxa (Bignoniaceae), Habropetalum and Triphyophyllum (Dioncophyllaceae), Apodiscus (Euphorbiaceae) and Polystemonanthus (Leguminosae-Caesalpinoideae) (Jongkind, chapter 11). Figures for animal species are lacking. Myers et al. (2000) use a wider definition of West Africa, including the forests from Guinea to western Cameroon. This area harbours 514 bird, 551 mammal, 139 reptile and 116 amphibian species, of which respectively 90, 45, 46 and 89 species are endemic. Upper Guinea harbours many endemic plant and animal species that are threatened by deforestation, habitat fragmentation, and over-exploitation. In the area from Sierra Leone to Togo between 100,000 and 470,000 km2 of forest has been lost since the turn of the 19th century (Sayer et al. 1992, Fairhead & Leach 1998). Animals might have sought refuge in neighbouring forest areas, but sessile plant species with narrow distribution ranges might have disappeared along with the forest. Many commercial tree species have been exploited to such extent that they have become threatened (Hawthorne 1996). Commercial bushmeat exploitation prospers in most countries, leading to the extinction of some animal species (Oates et al. 2000), or reducing the populations of other animals to such low levels that they may go extinct in the coming decades (Holbech 1998, Caspary et al.2001). Conservation of the remaining forest habitats therefore deserves ample attention, both at local, regional and international level. The high number of rare and endemic plant species are extremely important in this respect. This high number is partly due to the variety in environments in the area, including topographical variation, a range of soil types, and sometimes very steep climatic gradient. Table 1.1 Estimated cover of different forest types for nine countries in Upper Guinea (period 1985-1990, data from Sayer et al. 1992). Although there are more recent estimates of forest cover (FAO 2001, Matthews 2001), we prefer not to present those data here. The FAO defines forest as land with more than 10% tree cover of trees more than 5 m tall. Not only closed forest, but also savanna woodland is therefore included in their estimates of forest cover. 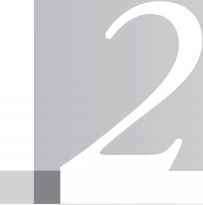 Figure 1.2. Map of continental Africa, with potential distribution of tropical rain forest in West and Central Africa. Three phytochorical regions: Upper Guinea Lower Guinea and Congo, centres of endemism. In Senegal, Gambia, and Guinea Bissau the topography is relatively flat. In the other countries a narrow plane coastal strip is followed by a belt of rolling hills, extending from the coast inland, followed by a belt of dissected table lands, varying from 300-600 m in altitude (Figure 1.3A). Further inland the Guinean backbone is formed by an interrupted mountain belt, formed by the Fouta Djalon (1540 m) in Guinea, the Loma (1950 m) and Tingi (1720 m) mountains in Sierra Leone, Mt Ziama (1390 m) in Guinea, Mt Wutivi (1340 m) in Liberia, Mt Nimba (1750 m) at the border between Guinea, Liberia and Côte d'Ivoire, and Tonkui (1190 m) in Côte d'Ivoire. 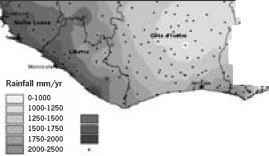 Smaller outliers are formed by the Akwapim and Atewa (750 m) ranges in Ghana and the Togo highlands (300-900 m). Locally, granitic outcrops (inselbergs) occur in an otherwise flat landscape. Many of these inselbergs are only up to 100 m tall, but are nevertheless characterised by a typical vegetation (Swaine et al. 1990, Porembski et al. 1994). The climate in Upper Guinea is determined by the seasonal movement of the sun, the interplay between maritime and continental winds, and the position of the coastline. When the sun is overhead the irradiance leads to a local uplift of the air, resulting in low pressure near the earth surface, giving rise to maritime and coastal winds. The area where these two winds merge is called the intertropical convergence zone (ITCZ). In December, the ITCZ is situated just behind the coast, between 5 and 7 degrees North. During the first part of the year the sun moves north, attaining its northernmost position at 23.5 degrees. The movement of the sun is accompanied by cool and moist maritime winds from the south, and heavy rainfall. Due to the rotation of the earth, these southern winds are deflected to the east, giving rise to southwestern monsoon winds. During the second half of the year the sun moves to the south, sparking off the dry desert winds from the north. Owing to the rotation of the earth, these winds deflect to the west, thus becoming northeastern winds. These desert winds contain reddish dust particles from the Sahara, and are locally known as the Harmattan. The magnitude and seasonal pattern of rain are to a large extent affected by the shape of the coastline. The moisture-laden monsoon winds hit under a perpendicular angle the Guinean, Sierra Leonean and Liberian coast, giving rise to an annual high rainfall of > 4000 mm/yr (Figure 1.3B). The rainfall decreases rapidly in a northeastern direction, declining 800 mm over a distance as short as 30 km (Voorhoeve 1965). Towards the interior, this rapid decrease is reduced, and the isohyets are spaced further apart towards the interior, attaining 1200 mm at the forest savanna boundary. In mountainous areas such as the Guinean backbone, the rainfall may increase again, due to orographic uplift. Figure 1.3 Environmental maps, focusing on the high forest zone of Upper Guinea. (A) altitude, (B) rainfall, (C) soil types, (D) cation availability, Ca2+, Mg2*, K+, (E) water holding capacity. The dots on the rainfall map indicate the location of the weather stations. At Cape Palmas, at the Liberian-Ivorian border, the coast deflects towards the northeast. The western part of Côte d'Ivoire is therefore situated in the rain shadow of Liberia, and receives substantially less rain. Only beyond Abidjan, the coast again assumes a southeast direction, at perpendicular angles with the monsoon winds. Consequently rainfall levels increase again up to 2000 mm at the coast. At Cape Three Points (Ghana), the coastline turns northeast again, leading to a decrease in rainfall. This pattern is reinforced by a cold seawater upwelling in front of the Ghanaian coast, giving rise to reduced surface air temperatures, less convective uplift, and less rainfall (Hayward & Oguntoyinbo 1987). Accordingly the rainfall drops from 2000 mm at Cape Three Points to 1200 mm in Takoradi, and to 900 mm at Accra, at the border of the Dahomey gap. Most of the forests in the eastern part of Upper Guinea receive an annual rainfall between 1600 and 2000 mm. Rainfall is strongly seasonal, with a long dry season from December to March when the sun is in the southern hemisphere. In some places there is a small dry season from July to August when the winds change direction from southwest to the west. In that case the winds come from the continent, rather than the sea, thus producing a rain shadow effect (Ojo 1977). Another reason is that during this period the ITCZ and its accompanying rains is positioned furthest north. Sites situated closest to the equator experience therefore two small dry seasons, whereas sites further to the north have one long dry season. During the rainy season cloud formation prevents irradiance to reach the earth surface. The average temperature and daily variation therein increase during the dry season because of the clear skies. The monthly average temperature may therefore vary from 24-28°C. The relative humidity shows a seasonal pattern, being 70% during the dry season, and over 90% during the wet season. 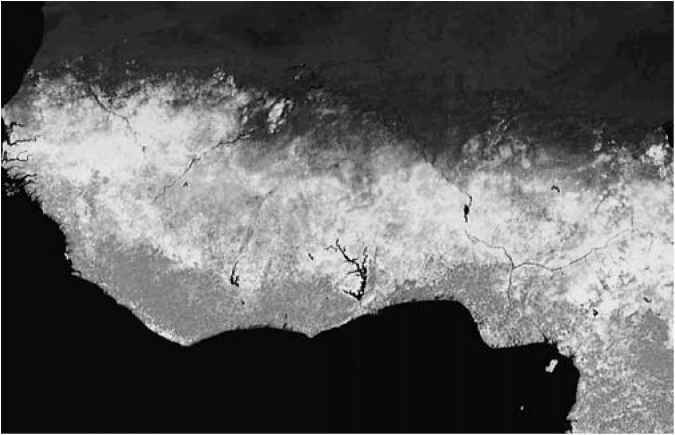 Figure 1.4 NDVI (Normalized Difference Vegetation Index) image of West Africa. The composite image shows the mean leaf area index (m2 leaf area per m2 soil surface) and the seasonal variation therein (expressed as the amplitude and the periodicity). The composite uses the average NDVI, the yearly amplitude and the half-yearly amplitude. Areas around the equator have a high average leaf area index and two growing seasons, more to the north the savannas have a high average leaf area index and strong yearly amplitude. The dark area in the north indicates no vegetation, desert. The picture is the result of Fourier timeseries analysis using the HANTS program. (Roerink et al. 2000, Roerink & Menenti 2000). 36 ten-day NDVI composed pictures are used from 1995 (Figure provided by G.J. Roerink). found, while in valley bottoms most soils are of alluvial type. The western part of the forest zone in Côte d'Ivoire consists mainly of granite and migmatite, with intrusions of metamorphic schists near Taï National Parc (Avenard 1971). 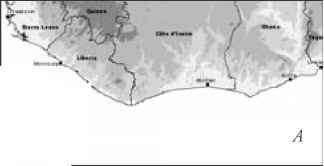 The eastern part of Côte d'Ivoire consists of schists and these underlie also most of the western and southern parts of Ghana (Hall & Swaine 1976). A band near the coast consists of Tertiary sandy sediments, whereas an even smaller strip of Quaternary sands separates the lagoons from the ocean. The different soil types of the region are displayed in the FAO's Soil Map of the World - Africa sheet (Figure 1.3C). The coastal strip features a variety of soil types, viz. Fluvisols (Sierra Leone), Regosols (Sierra Leone and Liberia), and Arenosols (Côte d'Ivoire and Ghana). The wet forest areas (Sierra Leone, Liberia, and near the Ivorian and Ghanaian coast) are characterised by Ferralsols. The moderately wet areas further inland are characterised by Acrisols, while in Côte d'Ivoire some inclusions of Cambisols are found. The highland areas are distinguished by their Lithosols. The coastal strip, running from Sierra Leone to southwest Ghana, contains Gleysols. These soils contain a mixture of clay and sands, but are not free draining. The wet forest areas near the coast contain Acrisols or Ferralsols. These are yellowish or reddish of colour, and contain kaolinitic clay minerals with iron and aluminium oxides (Martin 1991). The high rainfall has leached the soil to such extent that available nutrients are much reduced. The moderately wet areas further inland contain Acrisols of a reddish yellow colour. They are less acidic and richer in nutrients. In southeast Ghana, Vertisols are found. 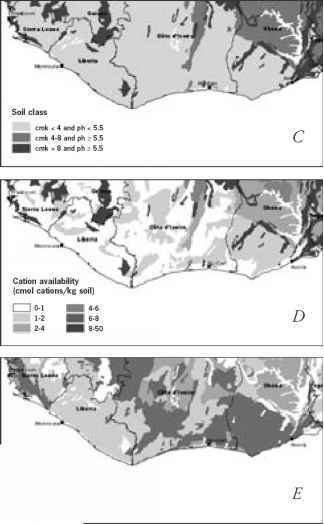 The cation availability of most of these strongly leached soils is low (0-2 cmol/kg), with the exception of a few higher elevation areas with younger soils, such as the Putu Range and Mt Nimba range (Figure 1.3D). The water holding capacity ranges between 10 and 120 mm water per m soil, with southeast Ghana having relatively high values, Liberia having low values and Côte d'Ivoire having a mixture of these (Figure 1.3E). Figure 1.5 Three different forest types in Ghana: (A) Moist Evergreen forest in Subri Forest Reserve. The big tree is Lophira lanceolata (Ochnaceae). (B) Moist Semi-deciduous forest on the University of Ghana Agricultural Research Station at Kade. The big tree is Antiaris toxicaria (Moraceae). (C) Southeast Outlier dry forest on the Shai Hills Game Production Reserve. This dry forest type receives less than 1000 mm rainfall per year, is short statured (c.10 m) and contains only few species. In West Africa there is a strong rainfall gradient from the coast to the Sahel. This has led to a distinct zonation of the vegetation, which can easily be seen from satellite images. Figure 1.4 shows a composite of 10-days NDVI images (Normalized Difference Vegetation Index), that shows the reflectance of the vegetation. Forest, savanna, Sahel and Sahara can easily be distinguished on the image. Along the precipitation gradient, the vegetation changes from wet evergreen, to moist evergreen, moist semi-deciduous, and dry semi-deciduous forest (Guillaumet & Adjanohoun 1971, Hall & Swaine 1981). Wet evergreen forest occurs in areas > 1750 mm annual rainfall, has an average canopy height of 30 m, and contains few deciduous species. Moist evergreen forests occur between 1500-1750 mm rainfall, the canopy is taller (40 m) but the forest contains fewer species than wet evergreen forest (Figure 1.5A). Moist semi-deciduous forest is found between 1250-1750 mm rainfall. It is the tallest forest type (50 m), and the upper canopy is composed of both evergreen and deciduous species (Figure 1.5B). Very few species are confined to this forest type, but it has the highest density of commercial tree species. The dry semi-deciduous forest occurs between 1250 and 1500 mm annual rainfall, and is adjacent to the savanna zone. The canopy reaches 30-45 m height, is no longer fully closed and contains many deciduous species. In Ghana two distinct forest types are found (southern marginal and southeastern outlier) in regions with less than 1250 mm rain. The southern marginal forest is shorter than 30 m, has a thick undergrowth, and may include high densities of gregarious species. The southeastern outlier forest is short (< 15 m), has only two strata, a low diversity, and is composed of few species (Figure 1.5C). In Liberia wetter forest types exist. Within the mixed forest there are monodominant stands, dominated by single species such as Cynometra ananta, Gilbertiodendron preusii, Tetraberlinia tubmaniana, Parinari excelsa (Voorhoeve 1965) and Talbotiella gentii (only found in the drier forests of Ghana -Swaine & Hall 1981). As elsewhere in Africa, most of these single-dominant species belong to the Caesalpiniaceae. 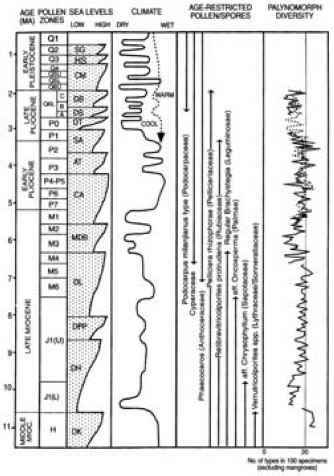 Figure 1.6 Summary of the main palaeoclimatic andpalynological trends from 10.5 Ma to 0.5 Ma for a 7000 m core taken in the offshore Niger Delta (from Morley 2000, reproduced with courtesy of John Wiley and Sons). The palynological diagram, excluding mangrove pollen, shows the major freshwater palynomorph groups in the boreholes. The composite profile covers Miocene (M), Pliocene (P) and Quaternary (Q). Figure 1.7 Summary palynological diagram showing the major palynomorph groups in offshore Niger Delta boreholes spanning the last 10.5 million years. (from Morley 2000, reproduced with courtesy of John Wiley and Sons). epiphytes are found (Hall & Swaine 1981). Mangrove forests are found in tidal and silty areas in lagoons, and along the rivers, up to 100 km inland (Jones 1992). The mangrove forests are up to 20 m tall, and dominated by Rhizophora species with stilt roots, or Avicennia africana with pneumatophores. Littoral woodland is found in the coastal belt, where the soil consists of nearly pure sand. These areas are flooded in the rainy period, but very dry in the dry period, leading to a kind of open savanna vegetation. Swamp forests are especially extensive in Sierra Leone and Côte d'Ivoire. They are subjected to periodic inundation. They have one tree layer, a well developed herb layer, and many large-leaved species. The most common species are Mitragyna spp. and Symphonia globulifera. Raphia palms replace the trees when the inundation period is longer, or when the swamp becomes permanently waterlogged. Gallery forests are found along the riverbanks. The high moisture availability allows them to penetrate deep into the savanna zone. One peculiarity of the human mind is that we tend to believe that what we see has always been there. For the African forests nothing is less true, as they have waxed and waned with climatic fluctuations. 25-10 million years ago, rainforests were very widespread in Africa, with tropical forests occurring as far south as the Cape (Morley 2000). A 7 km core taken from deep sea sediments off the coast of Nigeria shows how the vegetation and climate have changed during the past 10 million years (Figure 1.6 and 1.7). 10 million years ago, Graminae pollen increased in abundance, reflecting an expansion of the savanna in the Niger catchment, and a parallel reduction in rainforest. Temporal changes in the relative abundance of savanna and rainforest pollen closely paralleled changes in climate and sea levels. At the same time large areas of the continent underwent uplift, restricting the presence of suitable habitats for lowland rainforest. The combination of drought and reduced habitat probably resulted in widespread extinctions in the rainforest flora from the Late Miocene into the Pliocene (Morley 2000). During the Quaternary rainforests expanded and contracted with the glaciations of polar regions. About 18,000 years ago the last severe ice age climaxed, leading to lower sea water levels, cooler periods, and less precipitation. The rainforest contracted to a few patches, the so-called forest refuges. These were probably situated near Cape Palmas and Mount Nimba in Liberia, and near Cape Three Points in Ghana (Hamilton 1976, Maley 1996). The glaciations have left their imprint, and even nowadays many plants, and even some animal species are confined to these former rainforest refuges (Martin 1991). The last ice age lasted till 12,000 years ago, giving way to warmer and wetter climate, and an expansion of the rainforest zone. 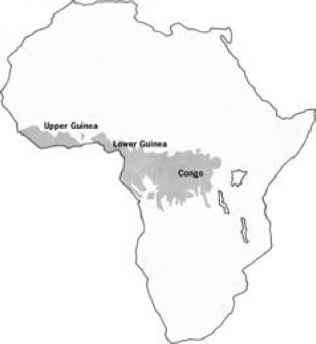 6000 years ago rainforest occupied a much larger area than presently, and extended across the Dahomey gap, thus connecting Upper and Lower Guinea. Africa has often been described as "the odd man out", because its rainforests have a much lower species richness, and less palm, epiphyte and understorey species compared to Neotropical and Asian rainforests (Richards 1973). One reason is that the African rainforests are less extensive than their Neotropical and Paleotropical counterparts, and thus can harbour a smaller species pool. Another reason is that the African continent is relatively arid, and there is a limited availability of lowland habitat below 500 m altitude. As a consequence, the effect of the glacial periods must have been felt much stronger here than in other continents (Harrison et al. 1981, Morley 2000). West Africa has a long history of human occupation. The first European travellers in the 16 th century give account of already large populations and extensive farming activities in large parts of the Upper Guinean forest zone. It is a wideheld believe that, since the early 1900s, rising population densities and unsustainable farming practices have led to a unilateral and accelerated rate of forest loss. This view has recently been challenged by Fairhead and Leach (1998) who suggest that extent of forest loss during the 20th century has been overestimated. Much of the deforestation either took place much earlier, or did not take place at all since the areas in question did not carry forest in recent historical times. Fairhead and Leach argue that in many cases traditional forest management practices actually have contributed to afforestation, and that many of the Upper Guinean forests are of recent origin, because population densities in the 19th and early 20th century have been much lower than before. This book is divided into two parts. The first part introduces the reader to the forests of Upper Guinea; their distribution, composition, biodiversity, conservation and management. The second part presents ecological profiles for a set of rare, endemic, or commercial species. Forests in West Africa, and specifically Côte d'Ivoire, have disappeared rapidly during the last decades. It is important to know the current deforestation rates, and to know where are the main forest blocks left. In Chapter 2, Chatelain et al. address these questions by analysing (changes in) forest cover at different spatial scales, using satellite images and historical analysis. Comparisons are made at subcontinental, national, regional and local scale. The spatial and temporal patterns in deforestation are explained in terms of socio-economic and geographic conditions. The Upper Guinean forests are bounded by extensive savannas. The transition between forest and savanna is surprisingly sharp, and can easily be observed from satellite images. In Chapter 3 Gautier and Spichiger analyse how climatic and edaphic conditions affect this forest-savanna transition at different spatial scales. In turn, the effects of climate and soils are modified by natural fires and anthropogenic disturbances. The forest savanna boundary is by no means stable, and has shifted considerably over time. During the last decades the forests have expanded in many places at the expense of the savanna. It is discussed how the present situation is the result of the simultaneous action of several factors in the past and present and the need for new policies addressing the questions of fire regime and land use is stressed. Within the forest zone, variation in species composition and structure is gradual and continuous. Nowadays, some excellent local- and national-level forest vegetation maps are available, but maps at a subcontinental scale are lacking. Exchange of experience and knowledge between neighbouring countries is hampered because the vegetation classifications differ. The combination of the existing vegetation maps is difficult because of the differences in criteria and legend systems used. In Chapter 4 Bongers et al. provide a forest gradient map for Upper Guinea, using forest inventory data of 40 large tree species. Variation in species composition is subsequently explained in terms of climate and soils. At the end of the 17th and 18th centuries the first botanical collections were made in West Africa, especially along the coast. The first floras for the region were published from the beginning of the 19th century, and from 1868 volumes of the Flora of Tropical Africa (Oliver et al.) became available; this flora was completed in 1937. The completion of the Flora of West Tropical Africa, covering the region east to western Cameroon, in 1936 was a major breakthrough, although it is concise (Hutchinson & Dalziel, second edition completed in 1972). Senegal, Gambia, Guinea-Bissau, Sierra Leone, Liberia and Côte d'Ivoire. It is worth attention that Liberia, where the flora is probably the richest for the region, is among the lesser-known areas concerning plant diversity. Adam (1971-1983) published a flora for the Nimba massif and, together with Jaeger (1980-1981) for the Loma Mountains in Sierra Leone. It was not until after World War I that local herbaria began to be established in West Africa. However, substantial West African collections are held only outside the region, above all in Europe (mainly at Kew, United Kingdom and Paris, France, but also at Geneva, Switzerland, Brussels, Belgium, and Wageningen, The Netherlands). Herbaria harbouring important collections from the Upper Guinean forest zone still exist at Abidjan (Côte d'Ivoire) and Accra (Ghana). intrusion has been a main barrier for species exchange, in a similar way as the Dahomey gap forms a barrier for species exchange between Upper and Lower Guinea. In this chapter, Kouamé et al. discuss the role of the V-Baoulé and other environmental factors in determining species composition of Ivorian forests. The rainforests of West Africa have been earmarked as one of the world's hotspots of biodiversity. This leads to the question: where exactly are the hotspots of biodiversity within this hotspot? The botanical background information necessary to delineate such areas is to date scarce or highly fragmented. In Chapter 6, Wieringa and Poorter explore how, and to what extent, herbarium collections (Box 1.1) can be used to define hotspots of biodiversity in West Africa. They selected 600 species that are rare or endemic to the closed forests of Upper Guinea. For the first time they present a higher resolution map that places the high biodiversity areas in a Guinea-wide perspective, and indicate in a quantitative way which areas are virtually unknown and merit further botanical exploration. Some of the centres of diversity they found have been postulated to be Pleistocene refuges. In an overall analysis, Wieringa and Poorter weigh the relative importance of history and environment in determining the current patterns of diversity. Holmgren et al. explore to what extent these distribution patterns are shaped by climate, soil conditions, and historic events, and indicate priorities for conservation. How can the botanical and ecological information presented here be used for the conservation and management of the remaining forest resources? In chapter 8 Bongers et al. explore the implications of the results of the work outlined above for conservation and management of forests in the area. They also address the current status of the Guinean forests and indicate where the best-preserved forests are left, and in which forest types preservation is scarce. The hotspots of biodiversity are located and linked to the protection status in the present system of forest reserves and parks. For the selected commercial species they show where the areas with large commercial stock are concentrated. Finally, the question of the potential trade-off between timber exploitation and biodiversity conservation is addressed. The second part of the ecological atlas contains ecological profiles for 286 rare and endemic species (Chapter 9), and 56 large, commercial tree species (Chapter 10). These species represent c. 11% of the total forest flora of Upper Guinea, and include the most important species from a conservation or commercial point of view. For the large, commercial species an up-to-date summary of existing information is given. For the rare and endemic species new relevant ecological information is presented, because hitherto little was known about them. One species is presented per page. Each species account includes a distribution map, photograph, line drawing, and environmental table. First a short botanical description of the species is given, followed by information on its chorology, distribution type, distribution range and its rarity. The environmental requirements of the species are described in terms of light, water and nutrient availability. Finally, regeneration, growth characteristics and main uses of the species are discussed. 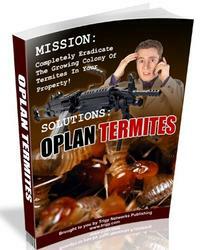 Each description is accompanied by the most relevant literature references. This part is ended with Chapter 11 in which Jongkind gives the complete checklist of Upper Guinean forest species. Synonyms are included and also look-up tables of families and genera. species, and drawings of nearly all are presented. Also, colour photos of 1000 plants are included. The present atlas provides background information on the forests in the region, and gives excellent additional information on the ecology and distribution of a large number of species. We thank M.D. Swaine for his thoughtful comments on the manuscript, and V. van Engelen for critically reading the section on geology and soils. What is Moist Evergreen forest in Ghana? Which rises at wet ever green forest? What can wet evergreen forest be found in Ghana? What is evergreen forest how many kinds of every green forest? Which part of Ghana is wet evergreen forests found? What the soils found under the moist semi deciduous forest of Ghana and why are they found there?